Requiem for the steth? Not Yet: Are you Listening? In 1816, exactly 200 years ago, Rene Laennec rolled a piece of paper into a cylinder to listen to the heart beat of an overweight young lady. This was the beginning of modern day auscultation. Today, we find that the art of auscultation is fading. 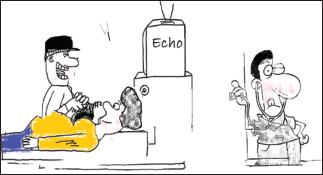 Many physicians, including most of us, order an echocardiogram on hearing a murmur. We often do not try to make an effort to go into the finer points of clinical examination to ascertain the clinical diagnosis before filling the request form. Is it the lack of time, loss of clinical skills, lack of confidence, especially on the part of the younger generation of doctors who might not have been trained so rigorously on the use of a stethoscope, or perhaps the understanding that more accurate information is available from an echocardiogram? Looking at this from the point of view of diagnostic accuracy, there is no doubt that the stethoscope cannot compete with the current range of imaging modalities available to make a correct diagnosis in cardiology. So why bother? But, will we be able to provide a handheld ultrasound to each and every physician in the country? Is providing an ultrasound enough? What about the required skill. Incomplete knowledge will lead to over diagnosis of pathologies which do not exist and missing of conditions which an inexperienced ultrasonographer is not trained to look for. The term for this is Victim Of Modern Information Technology (VOMIT). In addition, in countries where power supply is often a problem, charging an ultrasound machine will be an issue. The training of a doctor is in assessing a patient, taking the history, examination, which includes observation, palpation, and auscultation. The clinical examination helps the doctor decide what is the best course of investigation of the patient: Whether an imaging test is needed like an echocardiogram in case of a murmur or an electrocardiography and angiogram in case of angina. If the patient comes with severe shortness of breath with wheezing heard in a stethoscope and no audible murmur, you do not need any imaging to initiate treatment for bronchospasm. A well-trained doctor will be able understand the limits of clinical examination and also be able to understand the limits of imaging modalities. For instance, in patients with complex cyanotic heart disease, an echocardiogram is essential to give the correct diagnosis, but in a cyanotic child in distress, if the murmur has disappeared, we know we need to treat a spell and not look for another cause for distress. Taking another example, in a patient with systemic congestion and clinical evidence of pulmonary hypertension in the form of a severe parasternal heave and a palpable second sound and prominent pulmonary arteries with peripheral pruning on the chest X-ray, we would, in this case, question an echocardiogram report, which could pick up no evidence of pulmonary hypertension because there was no signal of tricuspid regurgitation or pulmonary regurgitation to probe. The echocardiogram report is rarely questioned, not realizing that the report is as good as the person doing the echocardiogram. As described by Eric Topol in "The Creative Destruction of Medicine" even the machine can go wrong, as he realized when he found severe mitral regurgitation with a handheld ultrasound, which actually was mild when rechecked on a proper echocardiography machine, the error was because the gain setting was too high on the handheld machine. If a highly trained cardiologist can make mistakes, anyone can! Therefore, it is essential that all reports should be reviewed very carefully in the context of the patient. For instance, if a patient clinically has cardiomegaly with a loud systolic murmur at the apex, an S3 and a diastolic thrill but the echocardiogram report says mild regurgitation, we need to question such a report. The confidence to question an echocardiogram would only come after a good level of basic training in bedside medicine. What will we see in the future? We may see the stethoscope in a new "avatar" with enhanced digital capacities with augmented sound which is digitally recorded and displayed. Perhaps the stethoscope will incorporate the ultrasound in it also as a "stetho-sono-scope." There are also suggestions to include medical ultrasound as a course in the undergraduate course so that undergraduate can learn to at least look for liver enlargement, IVC collapse, pleural and pericardial effusion, ruling out free fluid in the abdomen, diagnosing a pneumothorax and look for global cardiac activity. Whatever we do, we must remember that the patient is the center, listen to the patient, examine him, image him if needed, he is worried, sick and needs to get better. If he is short of breath, treat his shortness of breath, not his gall stone which the ultrasound shows. Remember "secret of the care of the patient is in caring for the patient."